Nestled between Trentino and Lombardy, and surrounded by the Adamello mountain range including the Presanella and Ortles Cevedale, the Passo del Tonale is an open and panoramic natural amphitheater rising from 1,884 to 3,100 metres above sea level. 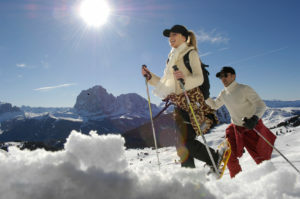 A renowned Winter resort of excellence, the Passo Tonale with its Presena Glacier always guarantees a long snow season. With full sun exposure, it is an ideal training ground for ski lessons, with trails suitable for beginners but not limited to more experienced skiers. From the mythical “Black Paradise” track, at 3km in length with a vertical drop of 710 meters, to the long and panoramic Alpine track at a length of 4,5km and a drop of 725 metres. Not to be missed is the direct Presena-Tonale-Pontedilegno route: 11km of track with a vertical drop of 1,740 metres done all in one go! Not only a Winter resort, the Passo del Tonale is a base for numerous mountain activities and excursions in the Summer which allow you to experience the nature of the Rhaetian Alps. Visitors can also see the numerous remnants of the historic White War which left its mark on the landscape. The mountains surrounding the Passo del Tonale were, in fact, a battleground during World War II: in the area you can visit the White War Museum in Vermiglio, and Temù. In 2011, a multimedia exhibition took place on an original battleground in Passo Paradiso entitled: Sounds and voices of the White War. The Paradiso cable car to the Presena glacier and the Valbiolo ski lift are open in the summer months, available to mountaineers and those wanting to try hiking at an altitude. Contact us staff to request information or to make a reservation!